Hello Cupcake, Meet Call Me Cupcake Thinlits Dies! Welcome to another TGIF Challenge, this week it’s time for a “Sweet” color challenge! Highland Heather, Soft Sea Foam, and So Saffron speak SPRING!…and maybe a cupcake? I gravitated towards my Hello Cupcake Sale-A-Bration Stamp Set and the All-New Coordinating Call Me Cupcake Thinlits Dies (released today, for a limited-time, while supplies last!). What do you think of my “sweet” pastel colored cupcake? Adhere a 4 1/8 x 5 3/8 piece of Shimmery White Cardstock to the card base with Snail Adhesive. Crop a piece of Highland Heather Gingham Gala 6 x 6 Designer Series Paper to 3 3/4 x 5″. Note: Be cognizant of the pattern so that it is even on all sides. Adhere with Stampin’ Dimensionals. Crop a piece of Shimmery White Cardstock to 3 5/8 x 4 7/8″. Zip through a Big Shot tucked inside a Polka Dot Basics Textured Impressions Embossing Folder. Adhere with Stampin’ Dimensionals. Use the Stamparatus to stamp the following onto Shimmery White Cardstock: Cupcake Wrapper in Highland Heather, Frosting (both stamps) in Soft Sea Foam, Sentiment in So Saffron. Snip the sentiment as shown with Paper Snips. Crop the remaining with coordinating Call Me Cupcake Thinlits Dies, Big Shot, and Magnetic Platform. Use the Big Shot and Call Me Cupcake Thinlits Dies to crop the following: Cloche & Window Sheets, Stand & Shimmery White Cardstock. Color the stand with an Aqua Painter & Soft Sea Foam Ink. Wrap the nob of the cloche with White Solid Baker’s Twine, securing with a bow. Adhere, assembled as shown, with Stampin’ Dimensionals. Add three Gingham Gala Adhesive-Backed Sequins for an added touch of bling. Here is a list of ALL the newly-released Sale-A-Bration Coordination Products! Note: These products are available NOW – March 31st, 2019 or While Supplies Last! Welcome Stampin’ Up! 2019 Occasions Catalog! We are so happy you have arrived! 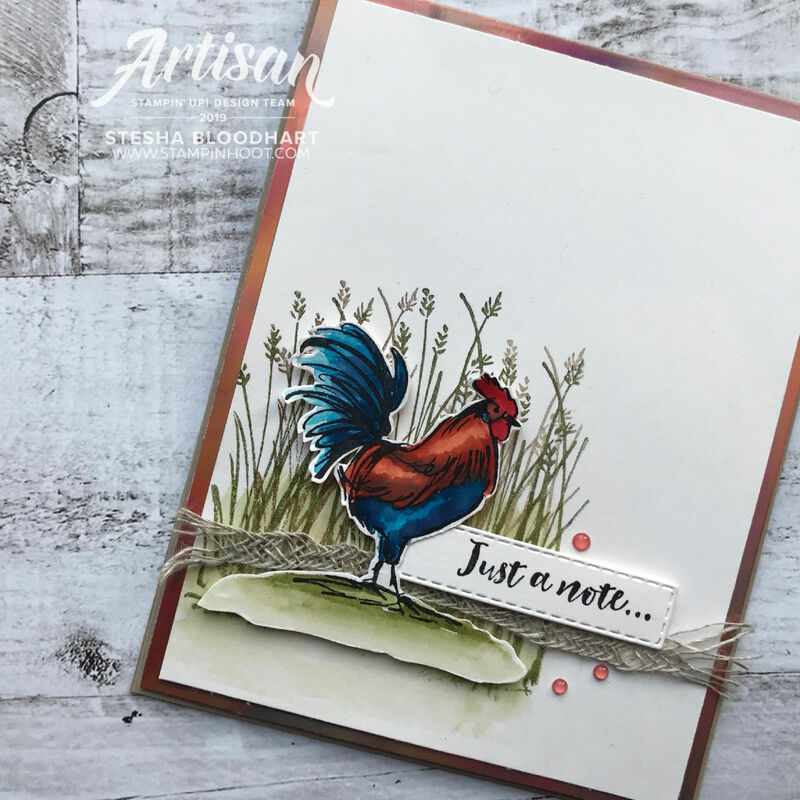 Packed full of new products, you don’t want to miss out on adding the all-new Cling Stamps, Rectangle Stitched Framelits Dies, and more to your craft room! Want to see what’s inside this fabulous catalog? Click here to download the 2019 Occasions Catalog! What’s even more exciting than the 2019 Occasions Catalog?? Save big with the 2019 Sale-a-Bration Catalog! Earn FREE exclusive Sale-A-Bration products for every $50 or $100 (totals before shipping and tax) you spend. Click to Download the 2019 Sale-a-Bration Catalog! There are three ways to get the most from Stampin’ Up! Sale-A-Bration. Below you will find a summary of each, so that you find the best fit and best bang for your buck! Earn FREE product for every $50 or $100 (total before shipping and tax) you spend. Many of the gifts coordinate with Occasions Catalog products, how is that for lots of bang for your hard earned bucks? Click here to view the Sale-A-Bration brochure and the array of products you can earn when you buy $50+ in current Stampin’ Up! products. SAVE EVEN MORE! Save 10% when you purchase coordinating product bundles. See ALL product bundles. Don’t you just love a bonus? Stock up, have a online book party, or build an order with a friend. When you reach $250 or more in products (total before shipping and tax), you earn a $25 product bonus in addition to the always fabulous Stampin’ Rewards. You can choose from the exclusive Stampin’ Rewards (Host Items at the end of the current catalogs) or ANY available products (bundles, clearance, etc). Are you ready to shop online and fill your craft room with the amazing products from the 2019 Occasions and Sale-a-Bration Catalog? Questions? Please feel free to contact me and I will respond pronto! Happy Shopping!